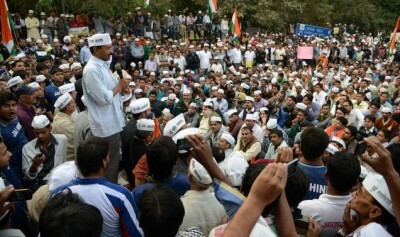 Mitali Nikore examines the rising popularity of the Aam Aadmi Party. There can be no doubt that Aam Aadmi Party’s (AAP) entry has resulted in increased electoral competition in India. During the December 2013 Delhi Assembly elections, the common man sent a message and gave the new party 28 seats. After a few days of political drama involving an SMS poll, AAP’s leader Arvind Kejriwal declared that with the “outside” support of the Congress Party, he would form the government in Delhi. Having campaigned on an anti-corruption platform, the AAP gained traction when the Lokpal and Lokayuktas Act, which creates an anti-corruption ombudsman, became the first law made in India this year on 1 January. Not surprisingly, the AAP promptly promised to give Delhi an effective Lokayukta. This week, the party enacted another populist move by reversing an earlier policy and disallowing foreign direct investment (FDI) in Delhi’s retail sector. With this, the AAP seems well poised to set the agenda for the upcoming general elections. Kejriwal is already at the forefront of opinion polls, with some quarters clamouring for his appointment as the prime minister in 2014. In September 2013, an India Today Group and CVoter poll found that 9 per cent of first-time voters wanted Kejriwal to head the next federal government. However, earlier this month, the Times of India reported that in a survey of India’s eight most populous cities (the January 2014 TOI survey) – Delhi, Mumbai, Kolkata, Chennai, Bangalore, Hyderabad, Pune and Ahmedabad – 25 per cent of respondents claimed to want to see Kejriwal as the PM in 2014. Though Narendra Modi of the BJP continues to lead the January 2014 TOI survey, it is increasingly seems evident that his ‘anointment’ is no longer a foregone conclusion: 44 per cent of survey respondents stated they would prefer voting for the AAP over the mainstream parties in the upcoming Lok Sabha polls, while a further 27 per cent maintained their vote would depend on the candidate from their constituency. Most crucially, only 29 per cent of the people stated they would not be voting for AAP in any event. Urban voters are sending a clear message to Modi: their vote matters and they are demanding a new culture of politics. Notably, the heir apparent of the Congress Party, Rahul Gandhi, has been summarily rejected by voters, at least for the time being. An online poll conducted by Ibnlive.com shows Gandhi receiving less than five per cent of the people’s votes versus almost 33 per cent for Kejriwal and more than 60 per cent for Modi. The comparatively high support for Kejriwal indicates that urbanites have connected with the AAP in an unprecedented way. This is because the AAP has successfully provided the disillusioned urban voter with a platform and produced candidates with which the constituency can identify. The historically high 66 per cent voter turnout in Delhi last year, with voting continuing for more than four hours after the 5pm deadline, is demonstrative of a renewed enthusiasm in the urban areas, for which some credit should go to the AAP. However, AAP’s continuation of the culture of subsidies, freebies and populist policies (case in point, the reversal on FDI) may not go down well with voters who feel the focus of the central government should be on promoting market-based economic development. Further, AAP may not be ready to lead the nation as is evident in the party’s lack of clarity on social, economic and foreign policies. In the upcoming general elections, the urban vote is likely to be split between the promise of strong leadership and economic development that the BJP offers and the AAP’s assurances of a corruption-free India. In any event, Indian politics has only gained from the emergence of this new political force, which seems to be effectively representing the aspirations of its namesake, the aam aadmi. Mitali Nikore is a New Delhi-based economic consultant. She completed her master’s degree in Economics at LSE in 2012, and previously worked as a consultant at the United Nations and World Bank. Great i think your views are shared widely by your readers! A very well balanced article. Concise, yet touches all the relevant points. Thank you, I was trying to be as neutral as I could while analyzing the issue. The irony of AAP lies in it’s misguided sense of representative base. Ironically, a political part formed with the basic assumption of having an educated contestant base seems to constantly demolish important policy decisions like the one on FDI. There could be a model based differentiation on policy implementation and not eradicating the policy altogether. As a voter base, we suffer from the ailment of functional literacy which should be converted into substantive literacy by such parties of urban outreach. This blog truly highlights the fundamental problems of populist politics which, in my view, could lead to a massive social, economic, and political consequence. Thanks Atish! Educated people would be inclined to vote for those who are similarly educated due to an identification with the candidate. However, when that same candidate takes policy decisions which are contrary to the policies one believes in, it is ironic! Also, on FDI, I have tweeted to Mr. Kejriwal, and he has not yet responded. I simply asked him if we could develop indigenous multi-brand retail chains in Delhi? What were his thoughts? I think that it can be done, and may be perfectly acceptable to all parties, but it needs to be a priority for them. Brilliant article, analyses the political scenario very well! I must commend the thorough research that went into the article .Cogent and objective , just the way it should be. However I slightly disagree with the view that AAP’s continuation of the culture of subsidies and ‘freebies’ will be a deterrent in the path to achieve a healthy mandate . They have been successful in selling these ideas (free of cost water and subsidized electricity) in Delhi . What I fear is whether this practice of selling pseudo-socialist or populist actions to garner vote is healthy for a country in desperate need of fiscal discipline and a responsible middle-class which learns to pay for public goods . It may not affect their electoral performance but does set a bad precedent . Thanks Prateek, you have dissected the issue of freebies very well. It is the difference between what will work, and what people supporting market based development want. A lot of us are apprehensive about AAP’s stand on social, economic and foreign policies. But it is interesting that in a 65 year old nation which has still a long way to go, the option of educated candidates without a criminal record seems to be a reality. Thanks to AAP, BJP which is confident of a sweep in 2014 elections, the current ruling party Congress and all the national and regional parties are busy creating a perception of being ‘aam’ – no more red beacons, no kilometer long entourage. This might be cosmetic, but definitely a strong message has gone across the political class. This is just the beginning and we might have to fight many battles, but AAP definitely seems like a ray of hope for some big change and a big experiment in democratic India. I agree Prerna. However, the recent incident where the law minister of Delhi led the assault on some foreign women in the middle of the night reeks of a continuation of the misuse of political powers. The Delhi CM’s blanket support to the minister in this case, without conducting an inquiry is also perturbing. Very insightful Mitali. This political stir was definitely required. Thanks to AAP for that. We have embarked on the possibility of a participatory form of democracy emerging in India out of the confluence of active citizenship and local governance. However, I believe it is important to gauge the impacts of this Thatcherism. My concern is with the huge amount of subsidies they are providing without any formula. I fear that there will be a paradox of the new welfare mixes exhibiting innovative dynamics and systematic organizational failure at the same time.